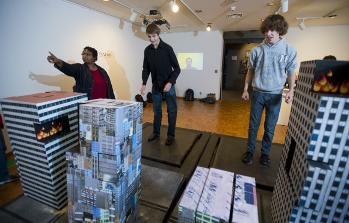 The League of Imaginary Scientists collaborated with the departments of Engineering and Art at Bradley University to create an interactive mechanized model of earthquakes and entropy. Galvanized by Dr. David Zietlow in Mechanical Engineering and his quest for the perfect model of entropy, The League of Imaginary Scientists has initiated an official investigation into entropy. The results include specimens from the League’s Entropy Archives, an interactive Entropy Machine, and a video of the League’s entropic thoughts.